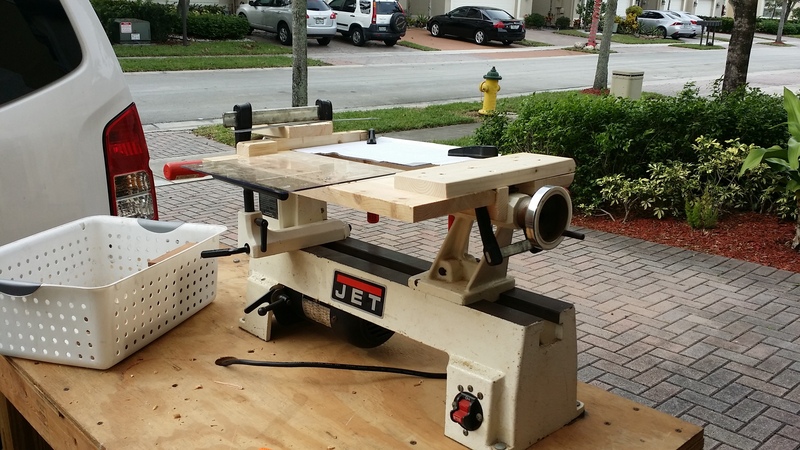 Attach an X-Carve to a Jet Lathe? 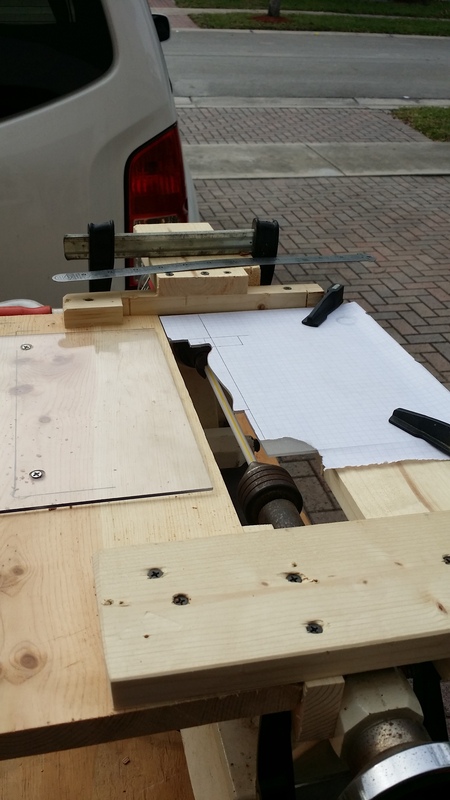 I have created a "poor man's" "CNC" type machine. I create small batches of fishing lures and I was looking for a way to create precision and repeatability when making these lures. 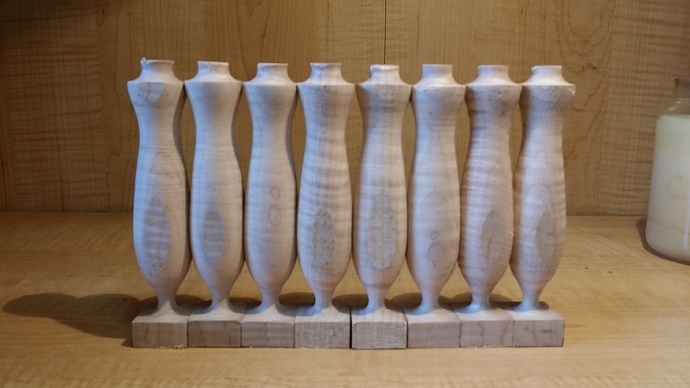 I started years ago just making them on a traditional lathe with lathe tools, one by one. 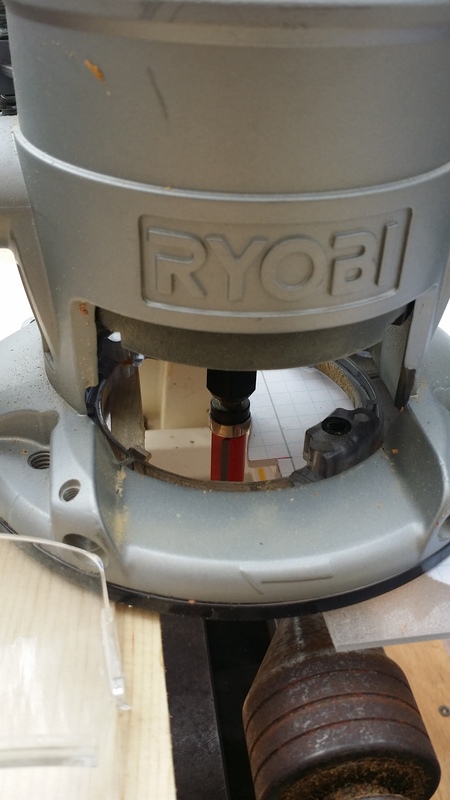 I have "advanced" my production to where, after watching some interesting videos on the interweb, I have attached a Ryobi router with a top bearing bit to run along a Lexan template. I slowly run the router back and forth taking about a .25" of material off the 2" x 6" square, wood stock. I slowly come up on the template to finalize the shape. The router bit is a .5" top bearing, straight cut bit. The wooden jg sits on the router and is lined up with witness block and secured in place with clamps. I put a drinking straw in the lathe on the centers and use a right angle square to line up the template. I use a second set of clamps to hold the Lexan template in place. The router bit runs on the downstroke/side of the workpiece, while the lathe spins @ 800RPMs. For the third prototype, it works very well. 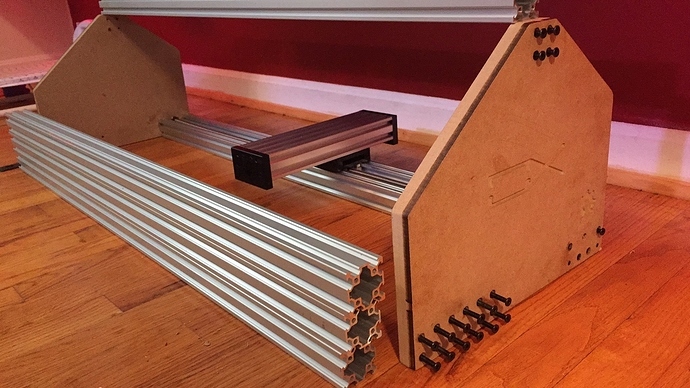 I would love to make it from metal and make it a precision, adjustable jig. Which brings me to this forum. Here are a few pics so you get the idea. 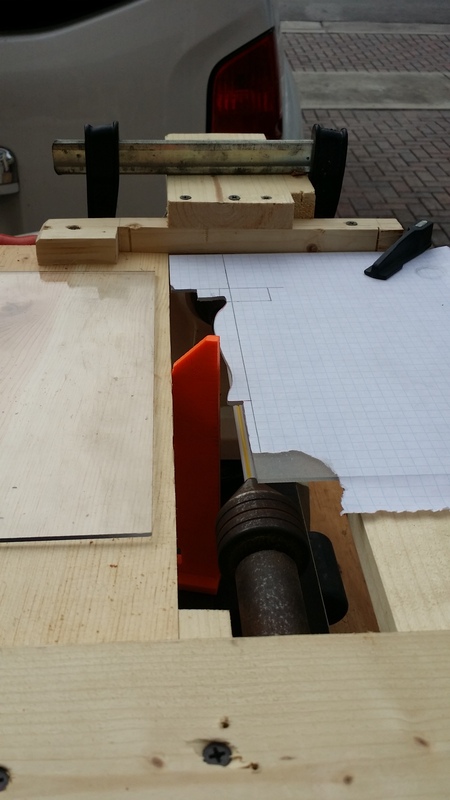 Could I adapt an X-Carve to my concept in place of my wooden, manually operated, template following device? What about stopping the lathe (spinning component) and adapt a stepper motor to that and be able to create a more dynamic design? Thank you all in advacne for you help and patience. I am very excited about advancing my designs!! What you need on the X-Carve is a 4th, rotary axis. If you do a search for the term '4th axis' you'll find a few hits in these forums. One problem with doing this is that you don't have a lot of Z axis clearance to play with. You'd probably have to mount the 4th axis below the level of the spoil board. Another issue is that the standard controller only support 3 axes but thare are alternatives. I don't believe that grbl supports more than 4 axes but I don't use it so could be wrong. I have seen a non CNC version in the past where the router was attached to the tabletop and followed a different type of template. What you are wanting to do is feasible. But you will probably have to right your own Gcode though. This should not be too difficult since you will only be telling the X and Z axis what to do. There is no Y axis with this specific setup. On q typical CNC lathe the spindle head of the lathe would be the Y axis, but it might be considered I,J, or K, I can't remember exactly bc I have no actual experience with a CNC lathe. I am sure others here can correct m if I am wrong. But it really does not matter in your situation. The Lathe spins at it's designated speed and that is it, it won't reverse or index (unless you manually perform this). In your situation you will turn the lathe on and get it up to speed prior to initiating the CNC functions. So to execute your plans the X and Z axis are the only ones which need to move. Another individual on the forum here has set their lathe up with a motor on the front of the machine, "The Mysterious 4th Axis". This is similar to your setup but his has more control of the spinning axis by his computer software. You might look for it, he can probably give you decent info on how the code you will need. I now use a parting tool to cleanly cut off the waste block at the bottom. The waste comes from the safety space to prevent to bit from hitting the live center on the lathe. 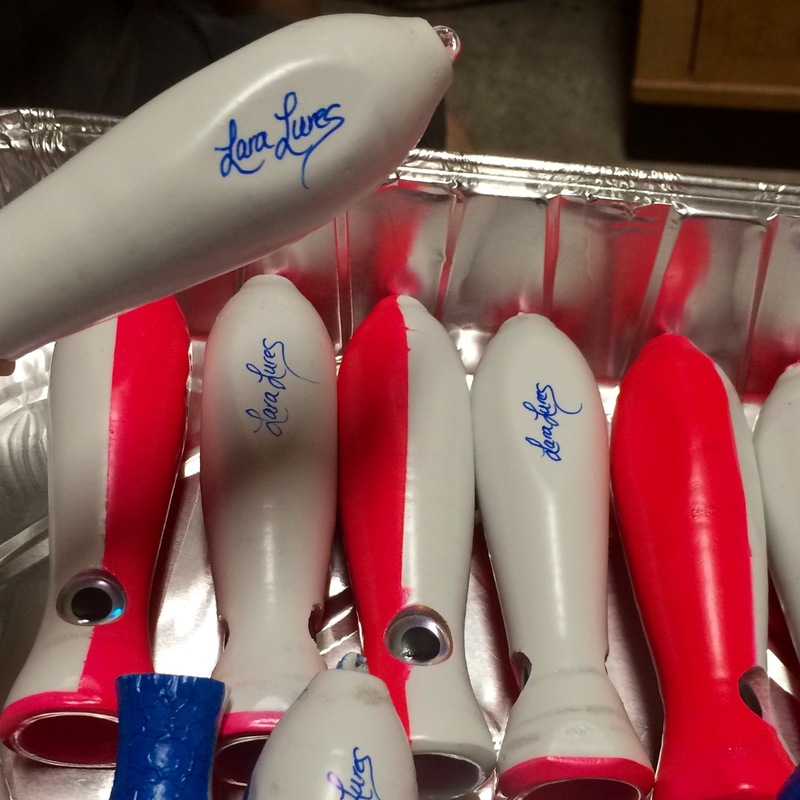 I have issues cleaning off the top/face of lure and addtionally creating the cupped face to create the splash. I cut the top off these, bored a .5" x .25" hole with a Forsner bit and then rounded it with a .75" ball burr, all done on a Jet Drill press. Very Not pretty, nor repeatable or precise. You don't quite need a 4th axis (that would be probably the best) but you could use a flip jig and do the same with a 3 axis. If you made a fixture where you clamped the lure vertically you could dish out the front as well. The quickest thing you could do is cut a hole in the waste board of a standard XC and mount your Jet lathe under it. Having the XC replace the router in your current setup. As other have said this would be done by adding a 4th axis (router axis) to the CNC. There are several threads about it on the board. I originally considered getting the XC without the controller and going with a different electronics package so I could have "room to grow" but I am glad I did not. I found it has been much easier learning how to use the XC as is. If I decide to add a 4th axis later, I will deal with replacing the controller then. But before you go that route you should check out 2 sided milling. Vectric has a couple of good tutorial videos demonstrating this. Interesting. I am building a machine for this exact task. Aspire supports rotary axis. Either by mapping a traditional axis or driving a true A Axis. This is what I use my SO2 with a rotary. Oh yeah, there are a few different ways to do this. The most clever on I saw was a rack and pinion setup that spun the work piece as it moved in the y axis. The magic part is in the CAM software. I knew this would be a big undertaking for sure. I figured i could put the X-carve right on top of my lathe. Turning as a process : Turning process refers to turning the workpiece by a lathe spindle. The lathe spindle is driven by its motor and gearbox to achieve the desire power, torque, and speed, it also holds the workpiece tight by some holding devices, so when the spindle rotates, it spins the workpiece too. While the workpiece is spinning, a cutting tool is fed to contact the surface of it to perform the cutting of its end face, inner diameters, outer diameters, threads, etc. So the workpiece is turning while the cuttings tools are moving along the linear axis to cut the components to its desired shape, dimensions, and surface finish quality.